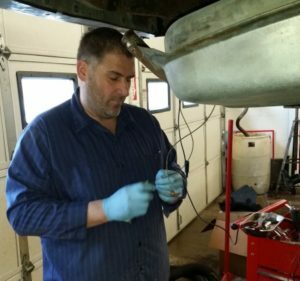 As a full service auto repair shop we offer a complete range of serivices. 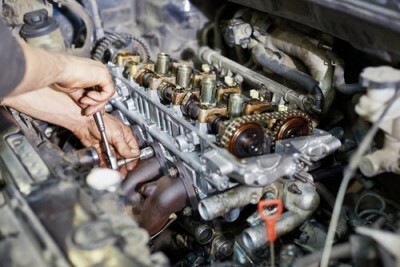 Our ASE certified mechanics will be able to show you the auto repair services you need. Below is a detailed list of many common repairs we provide and what to look for. 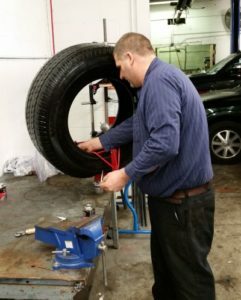 Be sure to tell our mechanics any symptoms you notice so that we can have the best information to diagnose your issues. Keeping up on brakes maintenance is important for several reasons. Brakes are an extremely important part of the vehicle for safely stopping. Besides your safety, brake repair and service done when symptoms first arise can save you money by preventing further damage to other brakes components. For instance, changing brake pads when they are worn out is crucial to prevent damage to your rotors. Worn out brake pads will quickly warp your rotors from metal on metal grinding so its important to have them checked and maintenanced regularly. What noises and signs indicate I need brakes service? The brake hardware being pointed at above is the brake pad indicator. When your brake pads get worn down to the same level as the indicator you will begin to hear a screeching noise from your brakes. There are noises, sensations, and warnings that indicate you may need brakes serviced. Here are the signs you should have your brakes inspected. These sounds can indicate your brake pads are worn out or close to it. This is a good time to have a brake inspection done. When your brake pads are closer to being completely worn out, the braking will go further to the floor because there is more room for your brake pads to travel. If you feel your brake pedal is spongy or needs to go further to complete braking, you could have air in your brake fluid and need to have your brake lines bled. Any vibrations or pulsations from the brake pedal or the steering wheel are a sure sign that something needs looked at soon. These are signs that you should wait to have your vehicle inspected. Waiting could result in more damage that will cost you more money. Pulsation from the brake pedal often indicates rotors are warped or close to it. If you notice that your brake warning light or your ABS (Anti-lock Brake System) light is on you should bring your car in for a free brake inspection as soon as possible. What types of Brake Pads do we put on? 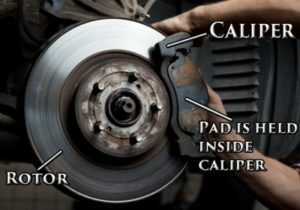 When choosing which type of brake pads or rotors to get installed on your car, there are some important things to consider aside from pricing. Most times, you get what you pay for, and when choosing your brake pads and rotors this is the case. There are three main types of brake pads that you can choose between. Semi Metallic Brake Pads, Non-Asbestos Organic (NAO) and Ceramic Brake Pads. The other types will wear out your rotors faster and the pads wont last as long. Semi Metallic and NAO pads often cause excessive brake dust which leaves residue on your rims and brake hardware. Brake Noise – Ceremic pads have very little brake noise if any at all while semi metallic and NAO pads can cause screeching and other noises. Overall, its worth spending the extra money to have brakes last longer without the extra headache. You will be glad you did. Getting loud noises from under your car? You may have a leak in your muffler or exhaust system. Over time, your exhaust system gets worn and rust with form on multiple areas of the exhaust. This along with normal wear from exhaust fumes being funneled through the system will eventually lead to needing exhaust repair. 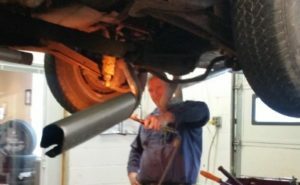 Muffler and exhaust auto repairs are one of our specialties. 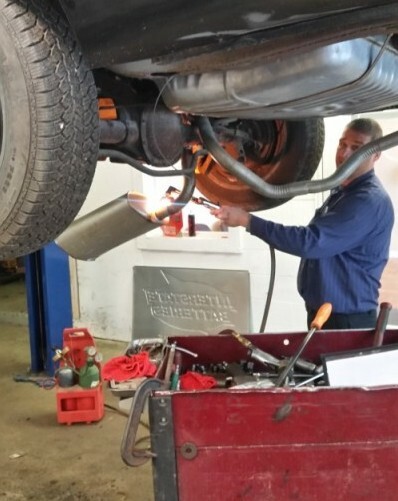 What kinds of exhaust system repairs do you do? 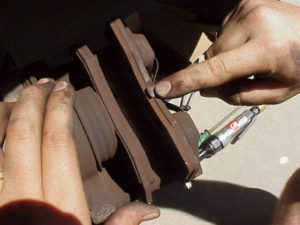 Our mechanics are experienced welders and can often patch up small exhaust leaks by welding. When that isn’t possible we also do replacements and repairs. Why exhaust repairs need to be done? Fixing Exhaust system leaks is important because exhaust leaks can reduce your gas mileage per gallon and it can also increase harmful emissions escaping into the atmosphere. SIGNS YOU SHOULD GET YOUR EXHAUST SYSTEM INSPECTED? There are many electrical components to any vehicle and as vehicle technology increases so does the amount of electrical components that may need fixing down the road. Our expert mechanics are skilled in diagnosing electrical issues from the electrical draw on the battery to vehicle computer’s causing poor engine performance. Our ASE certified mechanic specializes in electrical repairs so you can know we will get the job done and solve your issue. Electrical repairs can be just about anywhere on the vehicle these days and diagnosing problems starts with analyzing the wiring schematics, finding where poor electrical connection is starting, and fixing the connection. Rest assured, if you have an electrical issue, we can find where its coming from and fix it for you. Stop in our auto repair shop in Davison, MI today. Maybe your check engine light is on or you are experiencing noises coming from the engine of your car, so you’ve started trying to find out what is going on with your engine. You’ve come to the right place. We can help figure out what’s going on with your engine and make repairs or tell you the news you don’t want to hear… you may need a new engine. 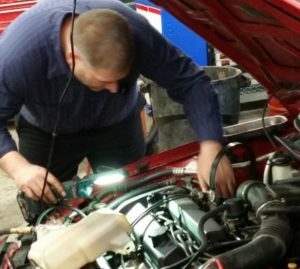 Most vehicles we see with a check engine light that needs diagnosed usually isn’t because you need a new motor, but will most definitely need to be brought in to our shop to plug your cars computer into our scanner. If a check engine light is on and you want to know more give us a quick call at (810) 653-6996. If you are experiencing more than a check engine light the rest of this page will help explain what your problems could be. If you are hearing strange noises coming from your engine that resemble a knocking noise, you should bring your vehicle in for inspection as soon as possible. Many times when an engine is knocking, a piston in the engine may be damaged and other noises coming from the engine can cause more problems if not fixed quickly. If you start hearing other noises be sure to check your engine oil as soon as possible and if its low fill it and bring your vehicle in for inspection as soon as possible. Sometimes we see belts that make noises and need replaced other times an engine replacement is the only option. If your engine is overheating there is usually a problem with your coolant system. When a engine is overheating we search for areas where you may have a leak in the coolant system and will give you an estimate on repairs.